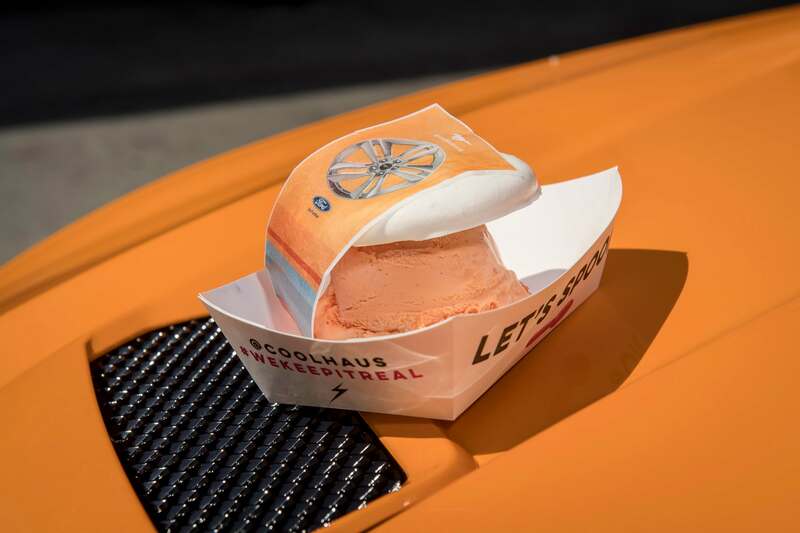 Two cool classics come together this summer as Ford introduces a limited-edition Mustang-inspired Orange Fury ice cream sandwich, created using Coolhaus Premium Ice Cream – the nationally celebrated sweet-treat brand known for unique, sweet-meets-savory flavors you can’t find anywhere else. Just in time for National Ice Cream Day this Sunday, limited-edition ice cream sandwiches will be given out for free starting today for four days at various locations in New York City in a Coolhaus ice cream truck outfitted with 2018 Mustang decals. Ice cream lovers can also tingle their taste buds with the zesty sweets at the Coolhaus shop in Culver City, California, over the weekend. Inspired by the new Orange Fury exterior color available on the 2018 Ford Mustang, the treats are the result of Ford color and materials design manager, Barb Whalen, engaging the creative Coolhaus product developers to capture the essence of the iconic pony car and its eye-popping new color. The treats are made of two fresh-baked Vanilla Whoopie cookies covered in orange icing, sandwiched around a scoop of the one-of-a-kind Orange Fury ice cream, then wrapped in a unique Mustang-printed edible wrapper made from potato wafer paper with edible ink. “I’ve always been a fan of the Mustang, and was super excited when they came to us with such a special project,” Coolhaus CEO & Founder Natasha Case said. “We thrive on helping our customers realize their vision and love to help create that special, one-of-a-kind experience – one that really makes an impact. Customization is an emphasis in the new 2018 Ford Mustang, from its 12 different wheel designs to its customizable 12-inch Digital Instrument Cluster. Performance and appearance packages extend the ability for customers to personalize their Mustang, as do three eye-catching fresh exterior colors – Kona Blue, Royal Crimson and, of course, the new Orange Fury.